The plan for downtown McLean will break it into three zones, but local residents want to make sure it doesn’t become a second version of Tysons. 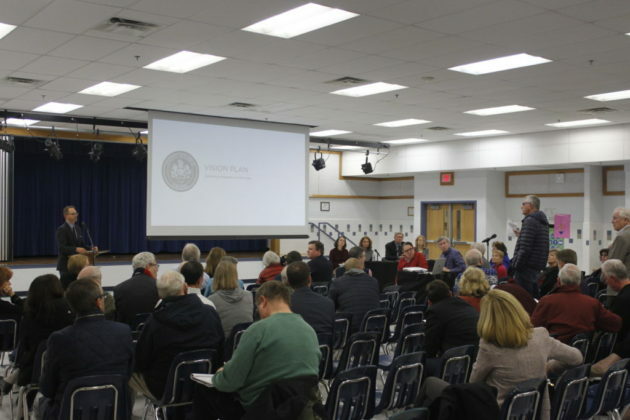 After a year of meetings with the community, contractor Streetsense presented its final vision for the McLean Community Business Center (CBC) last night (Monday) in Longfellow Middle School. In Streetsense’s final proposal, the McLean CBC would be broken into three categories: center, general, and edge. Colin Greene, Director of Planning at Streetsense, said the center zone could be occupied by either retail or residential spaces with a few offices. Buildings in this area would generally go up to seven stories, though Greene said those could be up to ten stories if they offer open space benefits. In the general zone, Greene said the building heights could go up to five stories tall, with an emphasis on scaling development down as it approaches the edge zone, which would primarily consist of two or three story residential buildings. 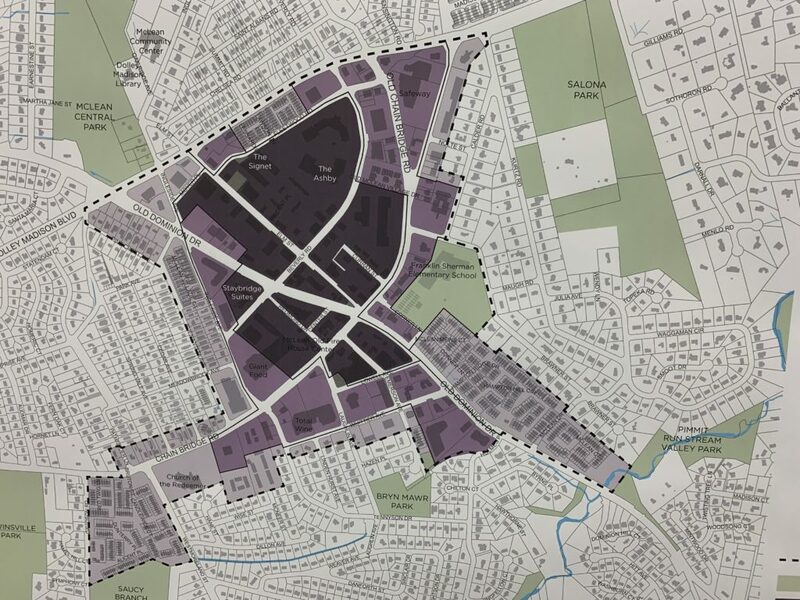 The map at the meeting showed the center zone in dark purple, with the general and edge zones in lighter shades. The new plan puts McLean’s downtown center at the corner of Elm Street and Beverly Road, a corner whose most notable occupant today is the “Wok & Roll” Chinese restaurant. But the proposal would see the corner eventually developed with towering new residential and office buildings with retail frontage. This new plan would also require substantial infrastructure improvements, including road improvements for Elm Street and Beverly Road and converting the nearby Center Street into a pedestrian avenue. Several of those in attendance at the meeting had concerns about the level of density in the new downtown McLean, particularly with the proposal of a seven or ten-story office building in the heart of the CBC. More than one McLean local said they didn’t want to see the downtown turned into another Tysons. 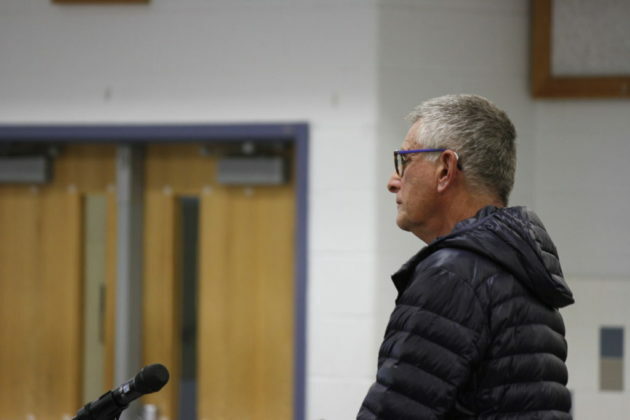 Robert Moll, a McLean resident, said he looked at the sudden expansion of development in downtown Bethesda, Maryland, and said he didn’t want to see this happen to McLean. Green said most of the office space proposed for downtown McLean would be replacing existing, aging office buildings rather than adding new office capacity. 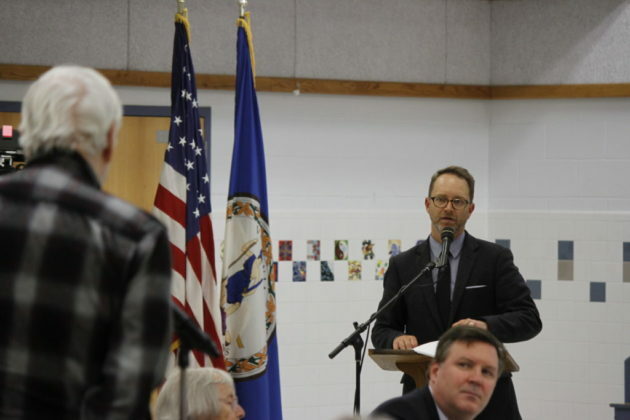 One local resident said that many of his neighbors and other members of the community would have liked an option for things to remain the same in McLean rather than see any new development, but many in the audience vocally opposed this idea. After the presentation, those in attendance browsed the final plan spread across several boards in the back of the room. Walkability, even since the early meetings, was one of the most talked about topics for McLean residents at the CBC meetings. Foust said working through the parking and pedestrian issues related to the McLean CBC study are going to be a priority as committees begin to meet in January to start looking at how to turn this vision plan into a reality.